Writing this post from Boston as the American Chemical Society meeting winds down – by Wednesday evening most of the action is over – it has been a good one. My first talk (see slideshare) went without a hitch, which was not a foregone conclusion, since the second half involved a live demo of the PolyPharma app, which didn’t exist 2 weeks ago, is half finished, and consists mostly of brand new original code. Besides a new app on the way and a busy month of conference presentations, there are changes afoot in the app lineup which will start to be noticed on the Molecular Materials Informatics product page shortly. 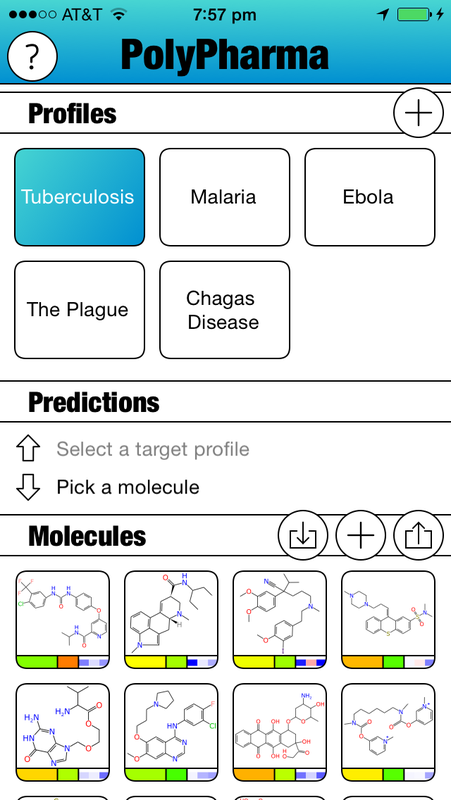 For chemistry app users, there’s good news and bad news. The bad news is that some apps have been retired, and some more are slated for the glue factory in the near future. The good news is that all the rest of the flagship apps are now free, as of several days ago, and the intention is to leave them that way indefinitely. The reason for this is quite simply that monetisation via the AppStore is no longer a good business model, now that the boom days are over, and the platform is settling down into a more mature phase of its lifecycle. There are plenty of other ways to make apps worthwhile from the creator’s point of view, so do expect rapid innovation to continue. The first app to get chopped was the MolSync app (not to be confused with the molsync.com web service, though granted it was pretty confusing). That app was originally created to intermediate between file hosting services like Dropbox, but now that the iCloud API provides this functionality in a way that can be integrated easily, there’s no reason to have a separate product. The next two in line were Reaction101 and Yield101. As of very recently, they are no longer available. Both of these products were an experiment in combining some of the high-powered features of the core library that drives the Mobile Molecular DataSheet app into smaller products with targetted functionality subsets, designed with education in mind. Since they were built, their functionality has been superceded by the Green Lab Notebook app (which is now free). In the interests of staying focused on our product roadmaps, we decided to pull the plug. To anyone who was happily using them, check out the remaining apps in the portfolio: all of their capabilities and much more can be downloaded and used for free. Expect the MolPrime app to be removed from the store quite soon. Its bigger brother – MolPrime+ – has already been made free, so there’s no reason to distinguish between them anymore. MolPrime-regular will soon be an ex-app. There might be a couple of other retirements coming up – some other apps may be left pining for the fjords – but for the immediate future, the product lineup will be quite a bit simpler and easier to navigate, with no loss of actual capabilities. Also, you may notice from screenshots of the PolyPharma app that there is a very different visual style, compared to the dark-and-brooding mojo that was the norm. This is quite deliberate, and is chosen to be more in line with Apple’s latest design preferences, and also have more similarity to XMDS (the OS X Molecular DataSheet). The tetrachrome basis (white/black/green/turquoise) is still in force, just that there’s a whole lot more white. It is also non-coincidently proceeding as the new core cheminformatics libraries are rewritten in Swift, for both iOS and OS X, so that desktop & mobile apps are drawing from a common codebase.